In Cambodia, the lack of access to safe drinking water poses a serious threat to the lives of millions. Civil war has left water distribution systems damaged, unmaintained, and dried up. With a rapidly growing population and the increasing impact of climate change the water shortage crisis is worsening by the year. According to a recent health report, unsafe water has become one of the main causes of under-five mortality in Cambodia. In some places, the situation is extremely dire, with remote areas generally having less access to clean water than urban areas and their surroundings.. Roughly 40 percent of secondary schools in Cambodia do not have drinking water facilities , and the vast majority of schools in remote areas struggle every day to find safe drinking water for consumption. The government cannot afford to build water systems for the schools. Given their substantially positive impact on selected schools performance indicators and their contribution to the establishment of good health, hygiene and sanitation practices at this formative stage of life, increased investment in these essential facilities will yield multiple dividends. The Saramrith School was built by the government in 1963, with more rooms added in subsequent years. The school accommodates up to 4,440 students and 180 teachers, but has no. safe water system and no funds to build one. The goal of the EMW project is to set up a UV (ultraviolet) system to provide clean water to the school, protecting students from the water-borne diseases present in untreated water. Consumption of unsafe water is one of the major factors contributing to high infant mortality rates, disease, and short life expectancy; our proposed project will help solve the problem by implementing in Cambodia the type of UV water system that has been successful in Vietnam. Once completed, this project will change the lives of thousands student in school. When this project is completed: 4,580 people will be provided with safe drinking water (4,440 students and 180 teachers at the school). All of the students and teachers (4,580 total) who receive safe drinking water will also receive sanitation benefits. Other benefits: hygiene education, capacity building and employment (EMW provides training for local water managers in operations and maintenance, financial management and community environmental hygiene and sanitation. Partnerships are formed with local authorities and international agencies to share experiences about design, management, operations, maintenance and financing to constantly improve the quality and efficiency of the program). This project will be the first Clean Water and Sanitation project to be implemented in Cambodia by EMW, which has successfully completed more than 100 water systems in Vietnam. The goal of the project is to provide access to sanitary drinking water at the school site in order to decrease the incidence of water-borne diseases. Improved access to, and use of, safe water at school will improve students’ lives considerably. Clean and safe drinking water helps prevent illness and loss of life and leads to better health and improved economic and education opportunities. EMW provides a long-term solution by bringing sustainable safe drinking water sources to the school. Water for Schools seeks to provide better opportunities for children in Cambodia by supporting and improving School Water Supply and Sanitation, and promoting education on the benefits of clean water and good hygiene practices. These activities are critical to the wellbeing and functioning of all schoolchildren. The most sustainable solution is to install a water filtration system at the location of the existing Saramrith School reserve tank, making it easy to feed the filtered water into the school’s existing piping. A water tower will be constructed near the existing reserve tank, and a new 1000 liter plastic water tank will be mounted on top. A small water pump will be installed to pump the water to this header tank. Because the power supplyat the Saramrith School is intermittent and unreliable, a generator will be installed to provide the necessary electricity to operate the water pump. Water from the header tank will then gravity feed through the UV filter and into a new 1000 liter water distribution tank that will be mounted on top of the existing concrete reserve water tank. This system will provide the school with a greater supply of clean water and increase the pressure at which the water is delivered. The success of this project will be determined by the Water School Committee members based on the number of students able to use the safe water system, and the improvements made in their health conditions. One of the indicators is the comparison of the number of fatalities and illnesses caused by water consumption occurring before and after the installation of the new water infrastructure. The safe water system reports provided by the school will be the critical source of data to be used in evaluating the success of the project. The engineers will conduct a scientific study that will look at the overall improvement students’ quality of life using the safe water system in school for one year after project is finish. The data from the school survey will used to produce an annual report by the end of the project. The peer educators play a key role in increasing public awareness of safe drinking water. Teachers and students will help to maintain the water system in the school – a very important way to control the quality of the water supply in the school. The Water School Committee will train the staff in the installation, operation and maintenance of the water filtration unit in the school on a day-by-day basis. The sustainability of the project activities is under the school WSC which will manage and maintain the school water system on a day-by- day basis after the EMW Foundation hands it over it to WSC and the students in the school help to support the program and use the water in the school. The process to maintain the water system and monitor it are very important in terms of long-term safe water and hygiene in the school. Who is going to pay for the long term O&M (e.g., mainly battery and module replacement, etc.). What is their current source of water? Is their current water source treated? How? By whom? What happens when the pump(s) crap out (every pump will crap out at some point)? Will the water charge (you will have one, won't you?) include O&M and eventual subsystem replacement cost? Hi Rick: Thanks for the questions! Here are the answers provided by the Cambodian team: Long term O&M will be taken care by the school water committees, using the project budget for O&M. Well water pumped is their current source of water. Long term O&M will be taken care by the school water committees, using the project budget for O&M. Well water pumped is their current source of water. did you think about a solar-powered pump instead of a generator? 1) The upfront installation costs of the solar array, batteries (unless you intend to only run the pumps during the daylight hours), pumps, controllers, and water system manager(s), compared to using handpumps, diesel pumps, wind turbines (but unlikely in most areas of Cambodia), and hand pumps. 2) Training of local staff in module installation (generally easy), maintenance (largely battery management) and repair of electric pumps when necessary. 4) A detailed cost analysis should be carried out to determine whether the costs of the PV systems were truly competitive with diesel, gravity flow springs, or grid electricity (if available within a mile or two) are reasonably cost competitive in terms of installation and O&M costs. 5) People will need to be willing to pay for eventual purchasing of degraded battery banks. They would also need to pay an operator / watchman / O&M staff to keep on eye on things, and collect water tariffs over the long term. 6) People are willing to pay (WTP) for materials and equipment (mainly batteries) and replacement pumps (whose frequency of replacement is typically dependent upon the water quality and well depth). 7) WTP depends upon people's willing and ability to pay for water. If they already are paying for water from some other available source, the likelihood of them being willing to upgrade to a solar PV system to a cost competitive diesel, gravity, or handpump. 8) I'm not current on the solar radiation levels and capacity of solar pumps in Cambodia. You would need to reference long-term meteorological data (usually easy to find at the provincial level at least) to ensure that the solar electric generators would be sufficient to meet demand. I would prefer to fund a bit more and help provide real autonomy instead of fueling climate change, dependency on external imports of fuels, generators, spare parts etc. all needed with fuel-powered generators as well. So caring for spare parts is not limited on solar powered systems. And: don't go for battery-banks as this is the only short-living part in solar-powered systems. Panels come with good glass-covers, radiation will do in Cambodia (as it does in Austria as well) and training (south-south) is already offered to lots of rural people (e.g. also Safer Future in Sierra Leone did Solar training for people from Nigeria, Sudan and now Tanzania). Don't choose old-school technology for people in poor or rural areas, choose a simple and reliable technology. 1. Would be helpful to see a detailed budget in excel format for instance installation of the UV system is 4,833 and the deep well is 1450 do these include only the material if what because labor is listed as separate. 2. What is the signboard and why is it so expensive? 3. Could you please explain what is the 'public announcement for bidding'? 4. What would be the maintenance cost? 5. The study that will be done is to assess the health conditions of the students and teachers including attendance record before and after the installation of the UV plant. Would you also consider the water (and food) consumed at home or elsewhere other than school? 6. How do you track the historical projects for instance that of Safe water system at Mai Hoa that was supposed to be completed in December 2008? Safe water system at Loc Thuy. I may have missed it, but where are the water quality testing results and cost for the analysis? How often will they do water quality testing (World Bank and ADB projects usually require WQ testing every six months)? Who will pay for this? I assume that there will be open and competitive bidding for the construction of the PV (not "UV") power supply and the water filtration and control system. EMW should stipulate the estimated monthly and annual operation and maintenance cost projection, so that users will be better able to assess their willingness and ability to pay for long term system use, including estimated system expansion over time. I don't know anything about the signboard. Perhaps EMW (Mrs. Tam) could answer that question. Water consumption at school is easy enough to measure, and necessary to set a reasonable tariff. I see no reason whatsoever to measure food intake. That is not relevant for this project. It's fine to track health conditions of the project beneficiaries, but that should be done by the local health officials, not the project. My understanding is that the focus is on providing good quality, reasonable cost water supply, not to carry out health surveys. 5. This project is focused on school-related activities only. 6. We will post the reports of the completed projects (including Tan Hoa and Loc Thuy) onto PWX website and will notify you when that is done. The two major reasons for the scoring 'fair' are inadequate information of past projects and the budget is not clear. Suggestions: It would be worthwhile to fund in those areas where there is no safe drinking water rather than installing an expensive UV system at a school where drinking water system exits. No doubt UV treatment is one of the best method to purify water that can be afforded only by a few developed countries like New Zealand. In the developing countries and in most developed countries chlorine based disinfectant is the primary method used. To use a very expensive system in one part of the region and having no source of drinking water in the other parts is rather impractical. The school children are perhaps exposed to bacteria contaminated water at their home. I would use several bacteria removal filters in the schools so that funds can be disbursed in other parts of the country. Tracking system should be developed of all the projects as early as possible to get better score next year. Good Wishes. I assume that the students are boarders in that school, Otherwise providing potable water in school alone would be a very incomplete solution. It seems that the details of the project are not all in place or the spoksperson for the project is not fully informed. The usual doubts about long term survival of the system are probably justified if the water circulation system is powered by mecanical pumps ( whether actuated by a diesel generator or by solar panels). But the need is clearly there and the investment is moderate. I think the project should probably be financed but a strong recommendation should be made to NGO to take the long term survival of the project more seriously. This looks like a good project but the actual need is not clear. 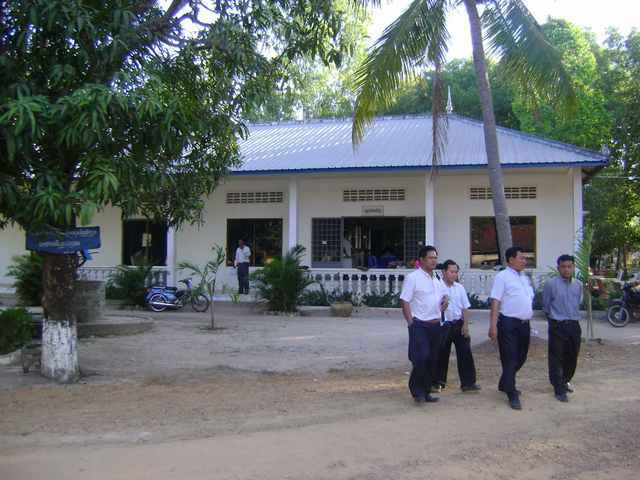 Also, i am being rather lenient because the project's implementer is the new EMW office in Cambodia. The lack of response and participation in the peer review process makes this very hard to support. Responsiveness and participation is key, and next time we expect to see it. The application has already provided numerous details in the Q&A forum. The proposed project implementation agency has substantial experience in carrying out rural water supply and sanitation projects. The only substantial difference is the PV pumping plant. As mentioned by another reviewer, current PV technology is based on extensive experience in many countries in the world. The selection of technology should be based on estimated per capita cost and O&M costs, and the ability of the user community to operate the system. For PV systems, operations are typically very simple.